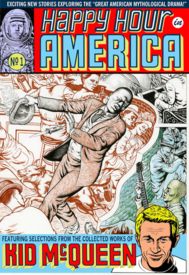 Tim Lane self-published six issues of Happy Hour in America over, roughly, the last decade – each providing another chapter in his ongoing project of creating the epic "Great American Mythological Drama" – and in the process has crafted a significant body of comics work. Some of this material found its way into his two Fantagraphics collections, Abandoned Highway and The Lonesome Go – but not all. We've sold quite a few copies of HHiA along the way, but not without some struggle, as availability was often spotty (due, no doubt, to time constraints on Lane's part). Now, Fantagraphics has taken over the publishing duties and distributing responsibilities, which should free up a nice chunk of Lane's time. We trust he will put this to use making more great comics like those you will find in the pages of this issue, which, starting from the Thomas Hart Benton-esque layout of the amazing wraparound cover (only half of which is visible here) through an issue length riff on the legend of Steve McQueen which, for all it's amazing attention to physical detail, presents reasders with a reality that is more interior and psychological than exterior and apparent.